This week's topic on the Illustration Friday web site was "Soar." A perfect topic as I just recently received a lovely order of justjohanna stamps and the above images were all part of my order...yes, even the "Soar" sentiment! This type of design is a first for me as it didn't include any layering or patterned paper. I was almost nervous about attempting this type of card! However, one of the things I really like about justjohanna images is how well they stand alone, without the need for a lot of extras. My cardstock is a beautifully textured cream paper. 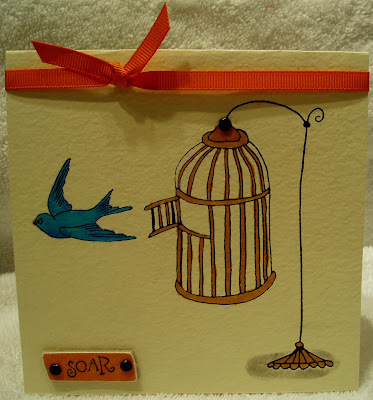 All of the images used on the card are separate; the birdcage, the cage stand, the bird, and sentiment, and they have all been colored with Copic markers. I added a small gray shadow under the birdcage holder to "ground" it and a black brad to act as the "hinge" that holds the cage to the holder. The "soar" sentiment was stamped on a small piece of paper covered chipboard, with two more black brads added to each side. A bright piece of orange grosgrain finished off the piece. Enjoy and check out the Illustration Friday web site...This is my first card created for this site and they post some very cool and creative art. You can see all of the entries for the Soar challenge here. EDIT: Uploaded a better photo of the card. Paint Can Full 'O Goodies! Since I used these items in a class that I taught I was somewhat limited on supplies. I could have picked up enough paper to cover the entire paint can but then the class price would have gone increased so I went with a belly band..and...I really liked the final result. Not only did the can still look festive but it was a breeze to decorate! I used more of Basic Gray's Figgy Pudding paper, the snowflake and polka dot designs are part of the same piece of double-sided paper. I wrapped the can with the two paper designs and a piece of funky green ribbon. A tag was added along with a small holiday flower image. The top of the paint can was covered in the same paper, using a large scalloped circle to highlight the flower image, which was colored with Copics and cut out before being attached with dimensional tape. Using paint cans is such a great way to package a themed gift, such as a at-home spa package, manicure package, jammie package...the possibilities are endless...what fun! I hope you've found some inspiration for when your next gift giving opportunity arises! Sorry for falling off the blogging bandwagon for a few days. I ended up with a nasty cold and didn't feel like doing much of anything, especially when I had to be up and preparing for Christmas. But I'm back now and am back with a few more gift ideas! The next idea is stamped candles. I have two versions to share; the first is a candle that has a stamped image directly on the candle and the second is what I call a candle wrap, which is basically a belly band for a candle! Both of these projects are super easy! 1) Stamp desired image on a piece of tissue paper that matches the color of your candle. 3) Don't cut, tear out image, tearing as close to the image as possible. 5) Use a heat gun to slowly and carefully heat the image. Be careful to not hold the heat gun in one position for too long or you'll get drips on your candle. Move slowly back and forth across your image. The wax will begin to melt and the tissue paper will melt into the candle. You need to take your time with this process, don't give up too soon. You'll know you're finished when you can't see any more lines of the tissue paper. This is pretty self-explanatory and there are so many options available for wrapping a candle. For this project, I used Basic Grey Figgy Pudding paper to wrap the entire candle. 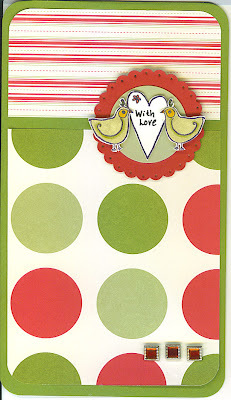 I then punched out a large scalloped circle, layered it with a plain red circle and then added my stamped and colored image to the top of both circles. I also added a piece of silver cording that was wrapped around the candle and through two eyelets before being tied in a bow. I'll be back tomorrow with a final project and fun way to create an all enclosed gift package! 1) Purchase tiles from local hardware store, mine came from Lowes. I prefer a rougher finish, I believe these are tumbled marble. This finish is also easier to stamp on vs. a high gloss finish. 2) Wipe off any dust that may be on the tiles. 3) Use Stazon ink to stamp image. If you smudge the ink, you can remove Stazon with rubbing alcohol and then try again. 4) Allow ink to fully dry and then paint the image with a glass paint. I used Pebeo paint, which can be purchased at most craft supply stores. (Follow the manufacturer's directions for firing). 5) Be sure to cover all of the lines made by the Stazon with the paint. Once the piece has been fired in your oven, it will be oven and water proof. You can also use a spray sealant to make them waterproof. 6) Add cork or felt feet to the back of the coaster to finish your piece! 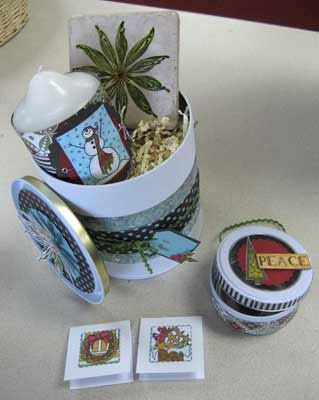 Below I've shown a set of coasters and matching box. I found this box at Walmart and the coasters fit perfectly! I simply painted the box with acrylic paint and stamped the outside. Piece of cake! This week it's Esther's turn to set the SALT challenge and she choose John 3:16, for God so loved the world. The verse John 3:16, "For God so loved the world that he sent his one and only son, that whoever believed in him shall not live but have everlasting life", is perhaps a well known verse but it is a real testimony to our Christian faith, thefact that the babe Jesus was born as a Savior for our sins. So that if you believe that he came to die, and ask for forgiveness you also can recieve the gift of eternal life in heaven. John 15:13 reminds us "Greater love has no one than this, that he lay down his life for his friends." This large wooden ornament was just painted a plain red with the wire so I got to work on adding some extras! I added the SU! 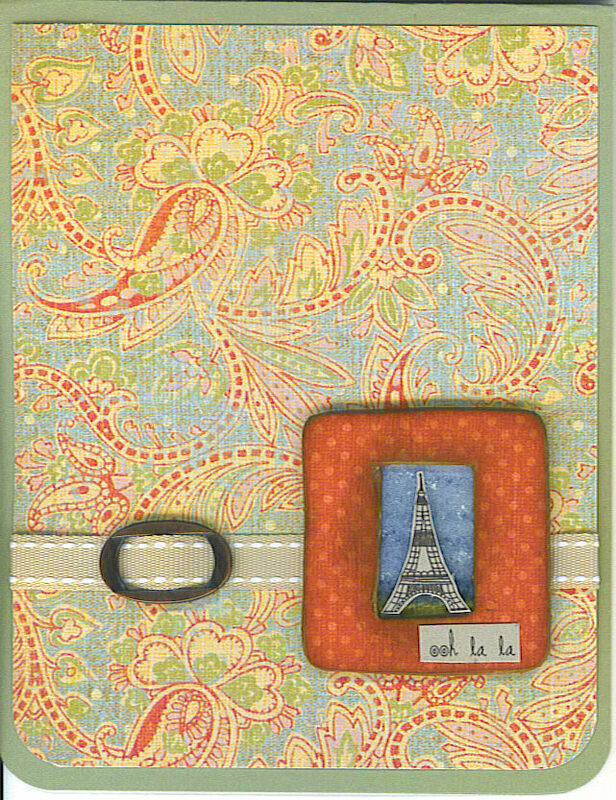 French Flair background stamp to the entire image, using a distress ink. A torn and aged piece of More Mustard, which was stamped with a diamond background, was added as the first layer and a thin strip of Old Olive, stamped with a floral pattern, was added on top. Two green buttons were attached with twill tape. Then...what to do about the words of the verse. I didn't want to just print them out from the PC so I went through all of my stamp sets and found words from different sets that I needed to create a portion of the verse that would fit on the heart. The toughest word to find was "world!" Notice how tiny it is...it's from a retired SU! stamp that included images that look like postage stamps and travel stickers. One of those stamps had a world! Yeah! The metal helped to give the small type a little umph. Other ribbons and hardward is fairly self explantory! Why not create a project based on this week's theme! If you do, please leave a comment on the SALT blog with a link back to your blog or gallery, it is always encouraging to know that you come and visit our blog! 1) Gable boxes - These versatile boxes can usually be purchased in bundles and are packed flat. They can be painted, stamped, or as I've done wrapped with a belly band. The belly band option is a super quick solution. I created this in just minutes! And guess what I just purchased? Stickles! OK - love them, new favorite product! You can just see a bit of stickle shine on the flower - fabulous! 2) Boxes - This is a standard jewelry box that I simply covered with pattered paper. The bottom section of the box is covered in a solid color-coordinated cardstock. I then used a few stickers (stamped images would work just as well) to decorate the top and added a piece of ribbon. This was the box I used to house the necklace, shown in the post below. Any other ideas you'd like to share? Feel free to leave a comment with a link back to your blog or gallery...I'd love to see your creations! Stamping...it's not just for cards anymore! Stamps can be used to create so many things now; home decorations, such as candles and coasters, wall art, tee-shirts...the list goes on and on. One of my favorites has always been jewelry and once I saw these 7Gypsies bracelets on Deb Olson's blog, I knew I had to try them out! The bracelets come in an unassembled kit, they are a breeze to put together! You stamp the image you want on your bracelet, attach the clear pebble sticker over your image, cut away the excess, and glue each finished circle into the empty holes. Then, using needle nose pliers, you link the pieces together, attach the clasp and you're done! To create my bracelet, I used some beautiful paper from Stampin' Up! The design went so well with the antique look of the bracelet. I really wanted a stamped image that I could color and it's not easy to find something that will fit such a small space but I looked through my stash of stamps and found a SU! set that was retired years ago. It has a floral image that was perfect. I only had to stamp the image once and then cut out different areas for my four stamped sections. The images are colored with Copics. I used one of the Papertreyink round tins to hold my bracelet (check back tomorrow for my necklace box...). I filled in the tin with a piece of coordinating paper and used stickers to create the inside design. This makes a great gift and the bracelet is really beautiful on...I really like the antiqued finish of the metal pieces. Get yourself one of these nifty bracelets and have a grand 'ol time! Hope this has inspired you to try creating some hand stamped gifts for your friends and family! The sketch challenge is below along with a second card I created using the same layout: (all images justjohanna) Why not give this layout a try? If you create something using the sketch, please feel free to leave a comment with a link back to your blog or gallery. I'd love to see what you've made! Sketch Challenge - Holiday Countdown! For this card I used the justjohanna Pauline partridge stamp, notice the right and left facing images...perfect for "holding" an object, such as my heart image, also from justjohanna. My thought was "sending love at the holidays" when I created this card. 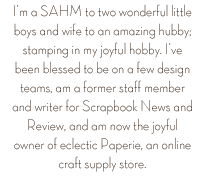 All of the papers are from Stampin' Up!. A Mavy scalloped circle punch created the backdrop for my loving partridges. Colors have been added with Copic markers and the bling at the bottom of the card is also compliments of SU! Sketch Challenge - Take Three! Even though this justjohanna image is a peacock, I kind of thought he could be perhaps a peacock dreseed up as a turkey...no...hee hee The background papers is part of SU! 's western designer paper, love these designs! And the faux stitching is a fun fit with the western paper. This is the first time I've used this style of faux stitching and I really like the look. 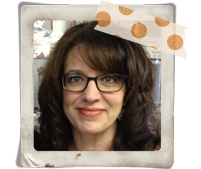 Emily, over at Stampin' and Stuff did a great tutorial on different styles of faux stitching. You can check it out here. My turkey...err...peacock has been colored with my Copics and then cut out and adhered, with dimentional tape, on top of a metal edged tag. I also colored the tag with the markers so my image wouldn't be on a white background. It's hard to see from the photo but the edges of the twill tape has been frayed for more of that western feel. Enjoy and Happy Fall Y'all! The top portion of my card was stamped using a jj cloud image, which is so much fun because it can be used in so many different ways; a cloud, of course, waves, steam, smoke...any other ideas? The bottom portion is a piece of patterend paper from K&Company (love them!) The balloon was paper pieced from another piece of K&Company paper. The ribbon is compliments of SU! and my chicklet and balloon basket were colored with Copics. Sentiment is lovingly surrounded by a piece of SU! hardware! Each month the jj design team is given a sketch challenge. This was the first challenge I participated in and I've got a bunch of cards to share this week, using the same layout. I loved this sketch and found that I had lots of ideas for images that would work well in this format. My first card showcases some of justjohanna's new Harvest images, that were released before Thanksgiving. I adore this leaf wreath image and it was a perfect fit for the circle section of the card. I'm also partial to the sentiment, which not only says thanks but also expresses gratitude. My card base is SU! 's Always Artichoke. Top section is the backside of some Crate paper and the bottom section is SU! 's More Mustard. The large Artichoke circle at the top was cut out using my handy dandy Coluzzle cutting system, which BTW I can't stand! LOL! It's so difficult to use!! OK, back to the card...The wreath was colored with Copics, cut out, and adhered (after attaching one lovely piece of chocolate brown taffeta ribbon) with dimensional tape to the larger circle. The sentiment has been colored and attached to two layers of color coordinating cardstock. Lastly, the tiny acorn was added to the edge of the sentiment...a lovely Fall embellishment! Why not try out this layout and leave me a comment with a link back to your site...would love to share in your creations! Johanna just announced the new design team on her blog! I'm thrilled to be staying on for the next term of six months!! The more I use justjohanna stamps, the more I love them! Not only are most of the sentiments clever and oh so cute, fun, and silly but they match perfectly with all of her whimsical images. There are so many possibilities...and all of them are fabulous! Johanna has released a boatload of new images over the past few months...go check them out on the justjohanna web site. Hi all! It was Casey's turn to set the challenge for the SALT blog this week and she chose "Jesus, the true meaning of Christamas..."
We all love celebrating Christmas because it is a time for us to stop, remember and praise God for the birth of Jesus Christ, our Lord and Saviour. HE IS the true meaning of Christmas. Not presents, not parties, not decorations, etc. JUST JESUS!!! I created a card, whose background (unfortunately) is not that easy to see...looks like I have a bit of a shine on my photo! The background is made up of many sentiments that are expressed throughout the holidays; Merry Christmas, Happy Holidays, etc. I then added a section of a verse from Luke 2:11, which announces the birth of Christ....The real reason to celebrate! Even though Christmas has been set aside as a day to remember His birth, we are blessed to be able to recall his miraculous birth each and every day! Pale blue paper used on the card is from Stampin' Up!. Star and brackets are chipboard covered with Basic Grey's Figgy Pudding (of course! ), and red cardstock is by Bazill. We' also love to see what you come up with too! Feel free to leave us a comment on the SALT blog so we too can share in your art!!! Eiffel Tower - Part Deux! 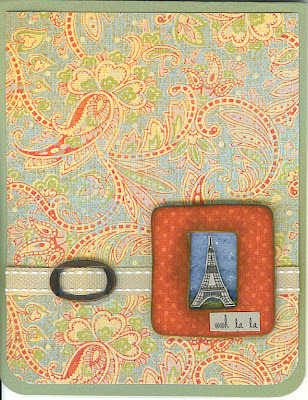 I again started with my Eiffel Tower image stamped on a pale gray cardstock and that's about as far as I got the first night! The following evening I remembered a card that Nichole Heady had created using a slide mount made from polyshrink. Since she's oh so generous, she posted the template to her blog, which you can find here. In measuring out the tower image I realized it would fit perfectly inside a slide mount! Finding this floral print, which I adore, was the perfect start to the card design. The paper is double-sided, floral on one side and polka dots on the other. I used the floral paper as a layer on a peice of SU! Mellow Moss cardstock. The bottom edges of the card were rounded using a corner round punch. The polka dot paper was glued onto the slide mount and I used Basic Brown ink to age the edges of the slide mount. To showcase the Eiffel Tower image, I created a tiny landscape "painting". Using a piece of watercolor paper, I used SU! water color crayons to create a sky and grass. I then used a very dry brush, dipped in white craft ink, to create teeny, tiny stars in the sky by lightly stippling the ink across the sky. 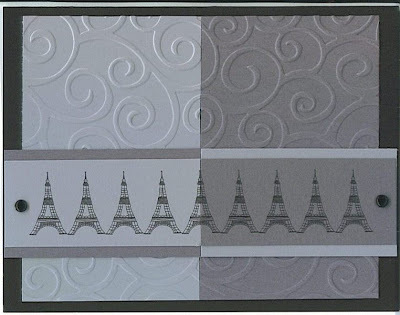 The Eiffel Tower image was then cut out and adhered, using stampin' dimensions, to the painting. The finishing touch was a piece of stitched ribbon slid through a piece of SU! hardware and an "oh la la" added to the bottom of the slide mount. Voila! This was one of my biggest jj challenges yet....Using this one image (a sentiment could be used as well) to create a card. It's a very small image, maybe an 1.25" in height. (Johanna has a large Eiffel Tower image too, which is just as fun!) In one of those late night, laying awake in bed thinking, "what in the world am I going to create with that image", moments, the lightbulb went on! Why not use the image multiple times, in a row? So that's what I did! Cardstock & brads by Stampin' Up! Light is mentioned so many times in the Bible, and has many facets of meaning and symbolism. I am the LIGHT of the World... The people walking in darkness have seen a great LIGHT ...The LIGHT shines in the darkness, but the darkness has not understood it...In the same way, let your LIGHT shine before men, that they may see your good deeds and praise your Father in heaven. God cares for us in much the same way that a parent cares for a child. That thought was the jumping off point for my coaster artwork. My verse, taken from Proverbs 4:18, describes how the path of God's children is like the shining sun. I thought that this was a wonderful verse to share with a child on how beautiful life is for us when we know the love of Christ. I created this with a mind towards adding some journaling to the back page telling of my love for my own child and my hopes for his life as he grows. I used paper by Cosmo Cricket, two double-sided sheets, so that all of the colors and patterns coordinated. The lettering are all rub-ons, don't recall manufacturer. The sun and moon images are by Stampin' Up!, cut out and colored with Copics. I had drew the arrow, the idea taken from a Paper Trends magazine...I like the added graphic and one of my rub ons fit perfectly within the arrow! Love when that happens! And aren't the hinges fun? I love the way they look on the outside but found out after I put this together that my book won't close! Yeah...I rarely try to figure out how something works before diving right in and, usually, making a mistake! LOL! However, I intended this to be something that sits out on a desk or shelf so I was ok with my mistake. If I had put the hinges on the inside then the piece would have closed like a book. I'll have to try another one of these coaster "books" another time, with the hinges in the correct location! Please create a piece of work using LIGHT as inspiration and leave the SALT team a message so we can see your creations! 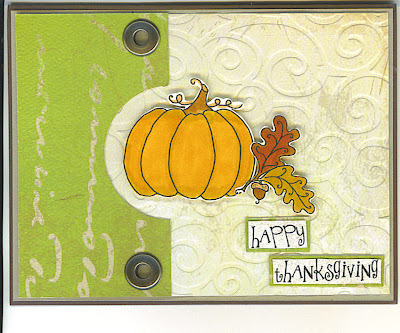 My second Fall, aka Thanksgiving, inspired card using more of my justjohanna stamps! I love these little gourds as much as I love the pumpkins! This card layout was inspired by Deb Olson (who doesn't she inspire every day!) :-). The front of the card is about 1.5" shorter than the back of the card, attaching colored cardstock on inside of the card to add some complimentary color to the patterend paper. 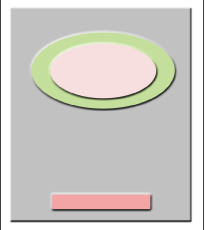 The corners of the card has been rounded with a corner round punch for a softer look. The orange strip of paper at the top of the page is part of a double-sided Fall paper, picked up at Wholly Scrap. My scalloped punch, made with a Marvy punch, has been layered with a smaller cream circle, which serves at a holding place for my gourds and leaf. A chocolate brown ribbon finishes the piece! PS - Speaking of Thanksgiving...check out the quote I found yesterday (located on the right side of my blog) from Helen Keller. It's humbling to read a quote from someone, who was faced with such adversity, who was still so thankful for their life. It's so easy to complain about petty things....Like me being cranky last year because my coffee pot broke during a huge snowstorm and I had no way to have my morning coffee! Geesh...I had to do some repenting for that attitude! :-) So...BE THANKFUL for all that you have and enjoy your holiday!! Can you believe in just a week it will be Thanksgiving? This year has gone by so quickly...I can't even imagine that in just about a month we'll be celebrating Christmas. I feel as if I just barely pack up the tree ornaments and cleaned up all of the pine needles from last year! Thanksgiving is one of my favorite holidays, right up there with Christmas! I love getting together with friends and family to just enjoy each other's company and all of that yummy food! I don't send out Thanksgiving cards (gee, I can hardly get the Christmas ones in the mail on time) but if I did...justjohanna would have an image and saying that would be perfect! The next few cards I'll be posting were created using the recently released Harvest images. I adore this pumpkin image (I just love pumpkins and anything made with pumpkin...can you say "pie!") and the leaves. 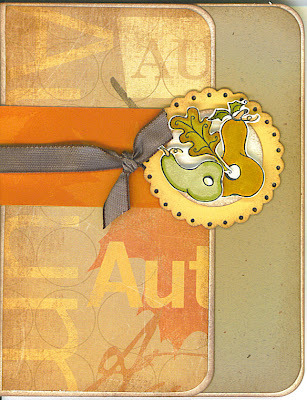 The center design was created using four different stamps; the pumpkin, the acorn, and two leaf stamps. I really like that Johanna creates images that face either left or right. It enables you to really change the layout of a design, like having two separate leaf images that point in different directions. Each of the images was stamped and colored with my Copics and then cut out and adhered with Stampin' Dimensionals. My card base is SU! Chocolate Chip, layered with Kraft paper. The green paper on the left and right sides of the card is from Crate (it's a double-sided piece of paper, the green is on one side and the cream is on the other). The cream paper was run through my Cuttlebug to give it a bit of texture and the green was attached with the new giant SU! eyelets - love them! I used a circle punch to create the notch. justjohanna Holiday Celebration - Take Three! Here's my last justjohanna card, created new the newest release of awesome holiday images! This is my favorite card out of the three (although I still laugh out loud at the sight of the tangled fish!) I really like the word background images that Johanna has created. I love what they say and I like that you can use them alone or layered with other images. I image that a pure white card with the word background stamped in black ink would be beautiful...Maybe I'll have to try that! Simple layout (I'm into those lately) for this card. Base is SU! 's Real Red with a fun piece of shimmery holiday paper (don't remember maufacturer) layered on top. The word stamp was then added to a piece of Whisper White and I traced around all of the type with a pale olive Copic marker. The edges of my words image have been sponged with Old Olive ink and then mounted onto a piece of Old Olive cardstock. A tab was added to the top of this piece, with a button embellishment. Lastly, the stocking was colored with Copics and added to the bottom (with a Stampin' Dimensional) of the words section. Fun! Don't forget to go to the justjohanna web site to check out all of the new holiday images...they rock! It's a justjohanna Holiday Celebration! - Take Two! Sorry about the disappearing justjohanna post! I wanted to have my SALT post at the top of my page for a day so I hide my tangled fish card for a few days! :-) The good news is that now Mr. Fishy is back (below) as well as a new justjohanna card, using another one of her new holiday images. And this one is just as fabulous as the fish! A rockin' bird! The new set of images include a bunch of these rockin' birds with sayings like, "have a rockin' Christmas", "you rock", and "rock and roll." Too funny! Simple card layout using SU! 's Bravo Burgundy as a base. The patterned paper is one I picked up from Wholly Scrap...don't recall the manufacturer but I've seen this paper making the rounds on blogs. It's a fun paper with a bit of shimmer built into some of the circles. The edge of my card has two rows of piercing and my bad rockin' bird was stamped on Whisper White, colored with my Copics, and mounted to a piece of Old Olive. The "you rock" sentiment fit perfectly behind a piece of chipboard that was covered with ink. A small piece of ribbon was added to the chipboard for an accent. Head over to justjohanna's web site to check out the entire catalog of holiday images...they are very, very fun! She's at it again...Johanna that is, creating fun new images for the holidays!! I'll have a few more justjohanna holiday cards to share over the next few days...this is the first! This is by far my favorite image from the collection...this poor fish wrapped up in Christmas tree lights with a star stuck on his nose! The look on his face is just hysterical! That Johanna has the best sense of humor! :-) And isn't the "tah dah" just the perfect sentiment to go with the fish? Now to pair up the fish with one of the Priscilla (cat) images...hum...now, that could be fun! My apologizes for the not so great photo. I was in a hurry to get these in the mail and didn't have much time for staging...so...it's a little difficult to see the doodled scallop border around the larger oval (both ovals cut with my new Nestibilities die cuts - oh my, how fabulous!) but it was a fun addition since the oval was looking a bit plain. I'm not sure of the name of the patterned paper but it was part of a bunch of fun holiday papers I picked up from Wholly Scrap awhile ago. I like it because it's not a traditional holiday paper, has a bit of a twist! Other plain cardstock is SU! Always Artichoke and Purely Pomegranate. Head on over to the justjohanna web site to check out all of the rockin' new images...More fun to follow over the next few days! While everlasting love displays the choicest of her stores. Each of us cry with thankful tongues, "Lord, why was I a guest?" When thousands make a wretched choice, and rather starve than come? Else we had still refused to taste, and perished in our sin. Send thy victorious Word abroad, and bring the strangers home. May with one voice and heart and soul, sing they redeeming grace. Now onto my fun little suitcase! I'm thankful to Valerie Stangle, a Splitcoast Stampers regular, for the suitcase idea! She included a link to the template, which you can find here, and that I used to create my suitcase. This is a tiny suitcase, about 3" W x 1.75" H.
Once I cut out the suitcase template from SU! 's River Rock cardstock, I stamped the bottom and top portions of the suitcase and then assembled the pieces. The bottom piece was stamped using SU! 's Print Pattern and Canvas background stamps and the top was created using another SU! set, All Aboard. I then aged my corners..because I can't even help myself! The handle was created using a piece of a SU! retired fancy fibers set, which was thread through two Old Olive eyelets. The last piece of the puzzle was to attach two pieces of ribbon, which wrapped around the entire suitcase, and was held together with two small pieces of Hodgepodge Hardware. We'd love to see what you create based upon this week's challenge. Hop on over to the SALT blog and leave us a comment with a link back to your blog or gallery! Without further delay...here is how to make a folded pocket card, which I used on my justjohanna card posted below! 6. Move to the corner diagonally opposite where you just made your last fold. Also fold that corner up diagonally but stop about an inch away from the crease. 8. With the larger diagonal fold in the upper left hand corner of your paper, fold the bottom right hand side of your paper (with the smaller diagonal fold) to the left. 9. Fold the larger diagonal fold forward so it's resting on top of the paper you just folded. 10. Wrap the remaining piece of paper to the back of the card. Now you can stuff the front two pockets with extra cards, photos, journal pages, or gift cards! This entire piece can be used as a stand alone card (you'd need to add adhesive to hold it together) or attached to a larger piece of cardstock. Fun stuff! !